My mom is an avid quilter, making a few quilts each year. She sews the quilts together on a machine and quilts them by hand. With her help, I made a few quilts while growing up, but somewhere along the way I lost the patience and the skills to make one. Two of my older sisters continue the tradition. One of them made a Stack-n-Whack quilt recently and my other sister wanted to learn how, so we had a sister’s day at my moms house today. Colorful fabric ready to be cut. 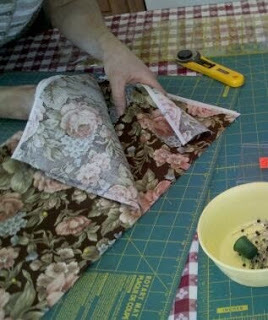 It’s amazing what a kaleidoscope of quilt patches can come from fabric like this. Is it lined up right? Age-old wisdom … measure twice and cut once! Finished quilt in a day!! This is the Stack-n-Whack quilt my sis and niece made recently. It is sewn (pieced) together, but still needs to be quilted by hand – takes yards of thread and hours of carefully moving a needle up and down. My other sis hopes to have one like this in a few weeks after sewing together all the patches that were cut today. Each of the stars is made from the same fabric. An assortment of squares, triangles, diamonds or wedges are cut from a stack of fabric and sewn together in a certain way to make a set of blocks that create a kaleidoscope effect when sewn together. 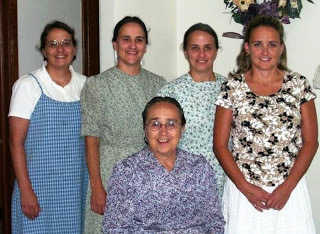 Everyone was too busy to pose for a pic today, so here’s one of my mom, sisters and I taken this past summer. At this time, I use my creativity to organize events and write, maybe someday – when I have nothing else to do, I’ll tackle making a quilt again. We are created in the image of a very creative God and I think we all have creativity in us. I have always been so intrigued by the time and detail that goes into making a quilt. Love it!